JHU students Helena Arose and Sarah Braver are putting on a living history performance in the Homewood Museum this April. The performance, funded by an Arts Innovation Grant, features the story of the Carroll family and takes place in various rooms of the Homewood Museum. 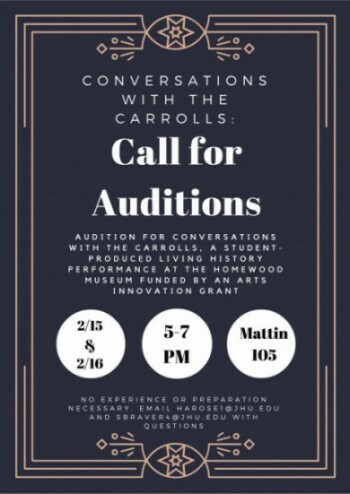 Auditions for student actors will be held Monday, February 15 and Tuesday, February 16 from 5-7 pm in Mattin 105. No experience or preparation is required to audition. Please contact Helena Arose (harose1@jhu.edu) or Sarah Braver (sbraver4@jhu.edu) with questions.